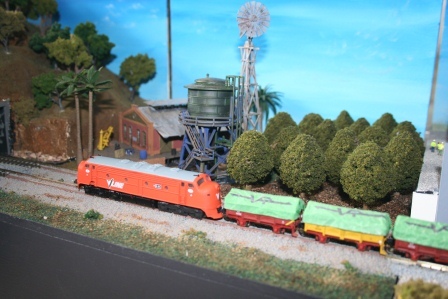 Description: This powered single module has a small narrow gauge siding with a goods shed. It serves the mangoe plantation that sits on the right side of the module. A overscale windmill and water tower serves the plantation, but even though it is overscale it seems to work well in the module. I am stilll to build the narrow gauge steam loco that works the goods shed. 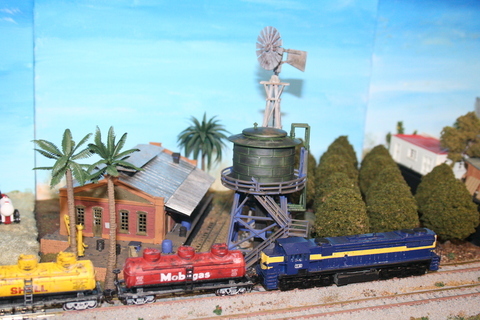 I spent a winter holiday in Far North Queensland where they had lots of narrow gauge rail sidings, throughout the cane fields, so I decided that a module would be a good memory of that holiday.